Back in August, Parks Victoria announced that they’ll be bringing two new glamping trials to National Parks in Victoria, one near Lake Eildon, and one in Mount Buffalo National Park. Well, they’re here sooner than you’d think. Under Sky at The Mountain will be opening its tent flaps for the trial on October 2, and will take bookings right up to December 17. 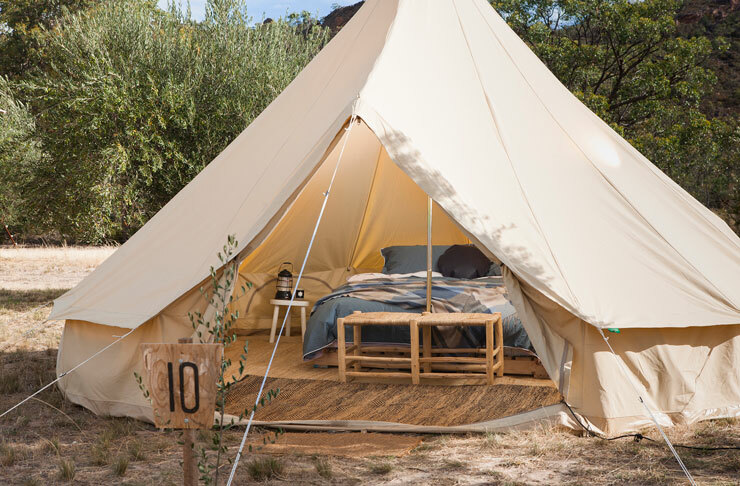 Under Sky at The Mountain will feature 10 massive canvas bell tents, which are fully equipped with a queen, size bed, rugs underneath, interior furnishings, linen, towels, and daily housekeeping. If you’re keen on cooking up a storm while you’re up at Mt Buffalo, you’ll be happy to know that individual gas cookers, cooking pots, and cutlery is included as well. Hot showers, and toilets are also on site along with a communal shelter and washing up areas. This will be the second pop up from the team at Under Sky following their residence at Mount Zero olives in the Grampians in early 2017. Mt Buffalo itself is beautiful and you can get 360-degree views of the sunset at The Horn. On your doorstep, you’ll also find 90km of walking tracks, canoeing, bike riding, and picnic spots by Lake Catani. For the more adventurous you can also hit Mt Buffalo for a spot of rock climbing, or even try hang-gliding. If you need a bit of inspo on what to do while you’re there, check out our rundown of things to do in The Grampians here. For more info and to book, head to undersky.com.au. Feel like roughing it? Now that the weather is improving it's worth looking for some great spots to camp around Victoria, here's our pick of 22 campsites you should think about camping at.